Start off your visit on the 14th (Sun): take a stroll through Odaiba and then get a taste of the local shopping with Ginza. On the 15th (Mon), you'll have a packed day of sightseeing: take in the spiritual surroundings of Sensō-ji, then admire the masterpieces at Tokyo National Museum, then take a stroll through Takeshita Street, and finally examine the collection at Samurai Museum. To find other places to visit, photos, and more tourist information, refer to the Tokyo trip itinerary builder app . Sao Paulo, Brazil to Tokyo is an approximately 28-hour flight. You can also do a combination of bus and flight. The time zone difference moving from Brasilia Time to Japan Standard Time is 12 hours. Expect a bit warmer temperatures when traveling from Sao Paulo in July; daily highs in Tokyo reach 36°C and lows reach 27°C. Finish your sightseeing early on the 15th (Mon) to allow enough time to travel to Matsue. Matsue sits on the banks of the Ohashi-gawa river, channeling its waters through a series of canals and rivers that add much to the scenic aspect of the urban area. 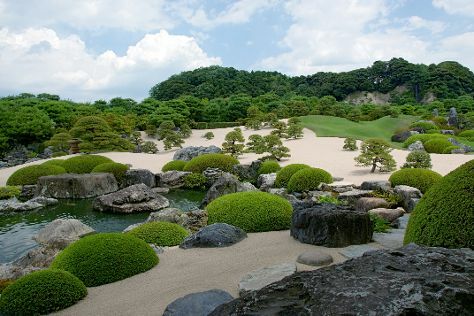 On the 16th (Tue), explore the world behind art at Adachi Museum of Art, contemplate in the serene atmosphere at Yaegaki Shrine, then take in the spiritual surroundings of Tamatsukuriyu Shrine, then explore the historical opulence of Matsue Castle, and finally see the interesting displays at Gogin Karakoro Museum. Get ready for a full day of sightseeing on the 17th (Wed): contemplate in the serene atmosphere at Izumo Taisha Shrine, take an in-depth tour of Shimane Museum of Ancient Izumo, contemplate the long history of Former Taisha Station, then explore the ancient world of Kojindani Ruin, and finally explore the world behind art at Shimane Art Museum. To see where to stay, photos, more things to do, and tourist information, use the Matsue trip planner . You can do a combination of flight and taxi from Tokyo to Matsue in 4 hours. Alternatively, you can do a combination of flight and train; or drive. In July, plan for daily highs up to 34°C, and evening lows to 28°C. Wrap up your sightseeing on the 17th (Wed) early enough to travel to Ishigaki. Start off your visit on the 18th (Thu): stroll through Yonehara Beach, then enjoy the sea views from Cape Hirakubozaki, and then enjoy breathtaking views from Tamatorizaki Observatory. Here are some ideas for day two: look for gifts at Yurateiku Market, then stroll around Kabira Park, and then enjoy the sand and surf at Kondoi Beach. For reviews, maps, more things to do, and tourist information, read Ishigaki road trip planning site . You can do a combination of taxi and flight from Matsue to Ishigaki in 8.5 hours. Other options are to do a combination of train and flight; or do a combination of train, bus, and flight. Traveling from Matsue in July, expect a bit warmer with lows of 32°C in Ishigaki. Finish your sightseeing early on the 19th (Fri) so you can travel to Miyakojima. On the 20th (Sat), enjoy the sand and surf at Aragusuku Beach, then visit a coastal fixture at Higashi Hennazaki Lighthouse, and then enjoy the sand and surf at Yonaha Maehama Beach. Here are some ideas for day two: snap pictures at Kurima Bridge, then enjoy the sand and surf at Toguchi no Hama, then take in the views from Irabu Bridge, and finally kick back and relax at Sunayama Beach. Plan a Miyakojima trip in moments using our itinerary builder. You can fly from Ishigaki to Miyakojima in 2 hours. July in Miyakojima sees daily highs of 37°C and lows of 31°C at night. Cap off your sightseeing on the 21st (Sun) early enough to travel to Tanabe. Considered a holy space where the gods once lived, the city of Tanabe teems with spiritual, cultural, and natural beauty. Kick off your visit on the 22nd (Mon): contemplate the long history of Oyunohara - Original Kumano Hongu Taisha Site, then take in the spiritual surroundings of Kumano Hongu Taisha Shrine, then contemplate in the serene atmosphere at Hosshinmon Oji, and finally take in the spiritual surroundings of Oyunohara. Keep things going the next day: contemplate the long history of Kumano Sansho Shrine, then stroll through Shirarahama Beach, then steep yourself in history at Kozan-ji Temple, and finally look for gifts at Nakata Foods Nakata Umeboshi Kobo. Discover how to plan a Tanabe trip in just a few steps with Inspirock's itinerary builder. Traveling by combination of flight and train from Miyakojima to Tanabe takes 5.5 hours. Traveling from Miyakojima in July, you will find days in Tanabe are slightly colder (34°C), and nights are about the same (30°C). Wrap up your sightseeing on the 23rd (Tue) early enough to drive to Kyoto. Visit Nijo Castle and Fushimi Inari-taisha Shrine for their historical value. Satisfy your inner culture vulture at Dotonbori and Sanjusangendo Temple. Next up on the itinerary: steep yourself in history at Kiyomizu-dera Temple, contemplate in the serene atmosphere at Tofuku-ji Temple, and wander the streets of Gion. To find where to stay, other places to visit, photos, and tourist information, read Kyoto tour itinerary builder app . You can drive from Tanabe to Kyoto in 2.5 hours. Other options are to take a train; or take a bus. In July, plan for daily highs up to 37°C, and evening lows to 28°C. Finish up your sightseeing early on the 26th (Fri) so you can travel back home.